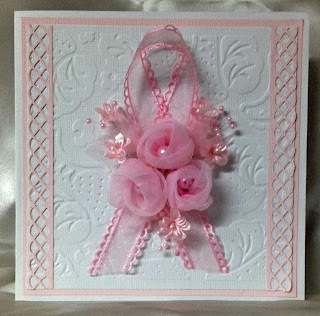 Joanie's Classy Card Corner: Thank You!! I am posting my final Link Up for Pink - Linking Party card and would like to personally thank everyone that has been involved, whether it is posting your creation, donating prizes, or giving your support. It has been another fantastic year and I am looking forward for our 4th Anniversary. So here is my card and again, thanks for your support. It has been a pleasure being a Design Team Member with some very awesome ladies. You've been lots of fun and have created some fantastic cards. The one lady that I want to give a huge Thank You to is Yolie for all the work she does, the time she donates, the creations she makes, getting super generous sponsors, just giving her all for a very special cause. And not to mention, keeping all of us in line. LOL - that's probably the hardest part of it all. So glad you stopped by to visit and will be looking forward to you visiting again soon.